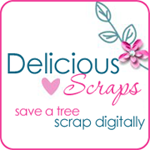 Delicious Scraps: It's the Best Ever Peppermint Creative Sale!! It's the Best Ever Peppermint Creative Sale!! I hope you all are enjoying your day. It's Black Friday in the U.S. and the digiworld is buzzing with sales!! Happy Shopping!! I wanted to show you this amazing sale that you just cannot miss - and if you do you will be kicking yourself! You get to make your own sale.You choose how much you want to save, and the more your shop, the more you save! Just log in and fill your cart. Type your selected coupon code in the the DISCOUNT COUPON box and redeem. If you spend $60 you only pay only $24 - Awesome deal and gorgeous stuff! Click on the image to start shopping!! This is one of the very first shops that I have purchased from when I just discovered my digital scrapbooking obsession. Love it!! Also make sure to check out Peppermint Creative Blog for more freebies,fun, challenges and inspiration! !